Steven Griffin Blues on the G String for "Multi-Level Cello Ensemble"
Blues on the G String was composed by Steven Griffin for five parts that can be played as a quintet or as a larger group with multiple cellists on each or all parts. Mr. Griffin is a Welsh composer and teacher who has composed a wide variety of choral, chamber and orchestral pieces. He is currently the Assistant Director of Music at George Watson’s College in Edinburgh, Scotland. His compositions and arrangements have been programmed throughout the world, with recent performances in Italy, Japan, New Zealand and the US. First, this piece is meant to be a bit of fun so don’t take it too seriously! It is for a large group of cellists rather than a quintet and is aimed for a group varying in ability from beginner to grade VIII+. Ideally there should be at least two players (preferably 4) on each part to allow for divisi playing. 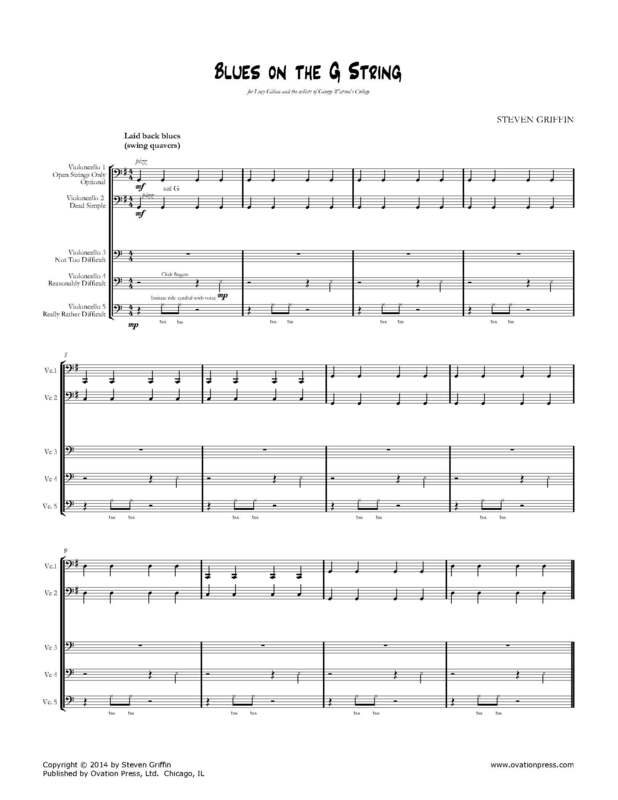 Download and print the score today to gain access to Blues on the G String for 5-20 Celli by Steven Griffin! Clea Morris, who played Cello 5 in the first performance, for her simple yet striking and beautiful front cover design; Cellodonia, the cello ensemble of George Watson’s College, Edinburgh, for their stylish first performance and their enthusiasm for the whole project.